This method took a lot of time and effort to assemble the jig, strip the vehicle of its under trays, fixings and, in most cases, suspension. 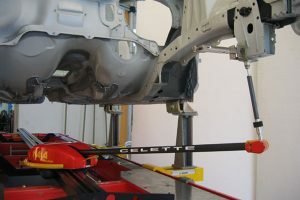 We would then place the vehicle on the jig brackets, only to discover that the vehicle is perfectly straight. The whole process took about 10 hours plus the cost of bracket hire, which can be in excess of £500. Recently, however, we have invested in a new piece of technology that has reduced that time to under 2 hours; the Cellette Naja (featured image). 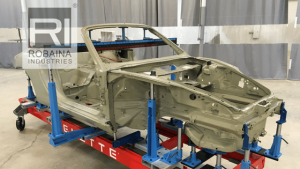 It uses manufacturer data and a measuring electrode to easily and accurately measure the body of a vehicle to ensure that its chassis and structure is not bent. 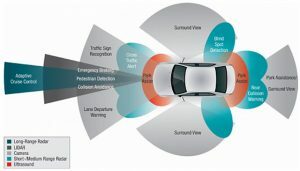 Advanced driver assistance systems (ADAS) are becoming more common on motor vehicles. All Volkswagen group vehicles built from now on will have adaptive cruse control as standard. 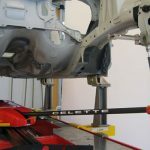 The slightest adjustment to the suspension geometry or body will cause significant differences in the way the ADAS operates and may even cause them to fail. 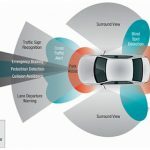 This is why, as a bodyshop, it is important that we keep up to date with the latest technologies that are being developed for vehicles. Over the next year, we will be investing heavily in ADAS calibration equipment. This ensures that we are able to carry out more repairs and calibrations in house. We will be able to calibrate ADAS on all of our manufacturer approvals. Along with the equipment comes training, which we will be taking part in; we will have trained our technicians to manufacturer standards by the end of 2018.